We had a work crew come by the house a few weeks back to tar the roads, or whatever it is they use to fix potholes. That was pretty exciting because in the 8 years we've been here, I've never seen a road repair crew come by. They were fixing the road in spots where potholes from last winter had gotten out of control. Taken from the window by my youngest. What really surprised me, and maybe I'm way behind times on this one, is how fast the roads dried!!! They'd block a lane, fix it while re-directing traffic to one side only, and then 20 minutes later cars were driving right over the spots repaired. We're talking large patches too, not just pot-hole sized ones. What a great invention, especially true if it's high quality and holds up well! I remember roads taking all day long to fix. I feel like I am diverting a bit off the topic, BUT you brought up a point that has fascinated me for some time now. Road Lines. I think about them every now and again when I am on a major expressway and the traffic is whizzing by at 80mph. Road lines. The only thing that keeps the whole thing from becoming chaos. I hope you get yours back soon! That's awesome! I'm glad they were able to get that fixed so quickly! Nice job indeed, well except for not doing the lines. That's usually right after the road is done. Perhaps next year? Or the year after? Or never? I hope they come back soon to fix the lines! I didn't realize how quickly everything dried. Impressive! They need to come to my streets!! They keep filling the holes and doing nothing else and they just keep needing filled again. I am sure this winter the roads will be a war zone again. I have to have my lines. I get uptight without them and have been known to get quite aggravated. How awesome! They need to come to my streets too! We live on a road tha runs through 3 towns. They finally repaved the whole thing and it is so nice to drive on. The pot holes used to be terrible. Isn't it nice to have them fixed? That's great that they did it before winter hit! If potholes are fixed when it's cold outside they will just pop right back out. We have problems with them here. Yup, this happened quite often here last year after all the cold and snow we had and was amazed at how quickly it could be done and dry, as well, too. that's wonderful they fixed them so quickly and like you i need the lines. When we lived in apartments they did this to the entire complex and had sections blocked off...They did the lines a week later. Nothing better than driving or biking/skating on a freshly paved road. I'm sure they'll do the lines soon.. ? I like road lines, too, and hope you get yours back soon. I never understood what the expression What in tarnation meant either! I think someone used to say it in some old cartoon! It's funny how something as little as road repairs can excite us. We had our neighborhood done about 3 years ago and I thought we died and went to heaven. Our roads were B.A.D.! I love it. Judging by the smell tar is still used over here. And needs to be used more often. Some of our pot holes are huge. Nice road. I bet it is such a pleasure to drive down a smooth surface. Oh wow, what a story! thanks for sharing! 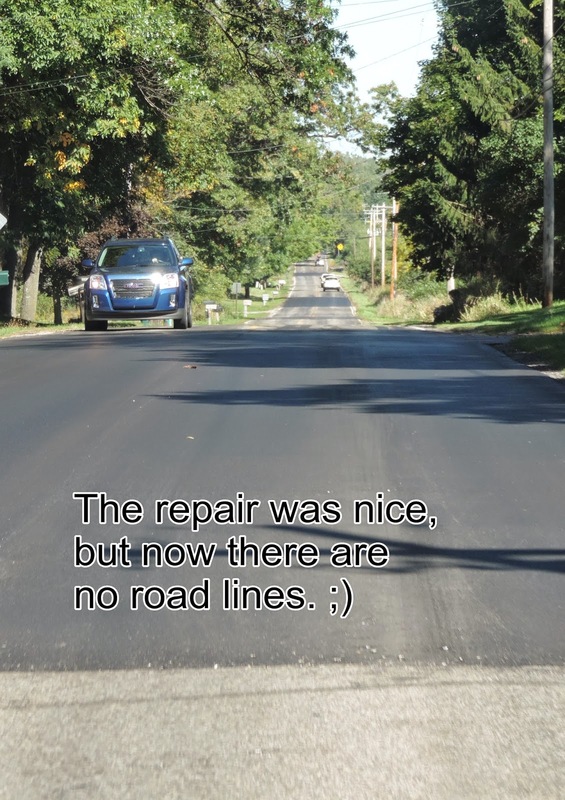 When they redid our road, they never came back and put road lines. Maybe they've forgotten you! Great to have nice new roads, but yeah, definitely keep an eye out for those lines! Things sure have changed and lets hope this road fix is for the better. I just notice they repair the same roads around here yearly. I don't think they last as long as they used to. Paint smaint. At least you're not being swallowed by big gaping holes any more. I am always happy to see the city truck come and fix the pot holes that open up every year from our harsh winters. Some of the holes get so big i am worried about damaging the car. it is vcool...and pretty amazing as well how fast they can patch a road...or even put one in...when they want...and then it takes some crews...4-6 weeks to do 20 feet...ha...must be a union thing...smiles. I hope they stop by and paint the lines for you. I love driving on newly paved roads. I hope they do the lines asap! So glad you have a smooth ride now! It amazes me at how fast things go when the workers put their minds to it. Hope it holds up. We rarely get any work done on our streets either! I can see that you would want the lines! Well at least they seem to do a good job re-paving your road. It is weird that they didn't put lines in. Are they coming back to do it? Lines or not at least the roads will be better yay! Nice that they got it done. They need to grade our road really badly. It's got washboards all up the mountain. I love a freshly paved road. Our little street got repaved last year -- the first time since we've lived here (17 years!). Guys never outgrow their interest in work machines. At least some of us don't. 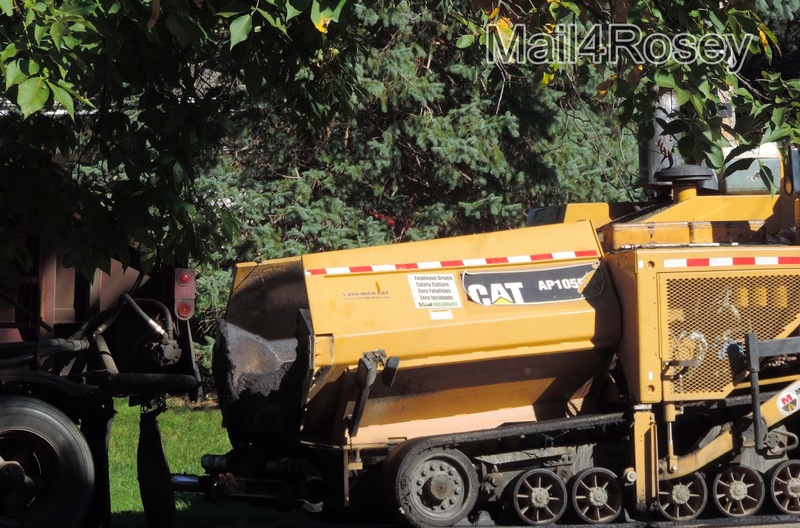 Depending on where you live, they repair roads with asphalt, bitumen or tarvey. It's all the same stuff. Like a rose by any other name . . .
Road lines will be next. I remember when they re-did the roads around here, main roads get painted that day, off roads takes a few days. Not sure why either. Should all be done in a day I think. They look so shiny and smooth now, hope the lines are getting done soon! Too many bad drivers out there. I live in PA, so we basically have two seasons: winter and road construction season. LOL. I see these things all over the place right now. I hope you get your lines soon! We don't have lines on most roads around here. I live in a small town, though. 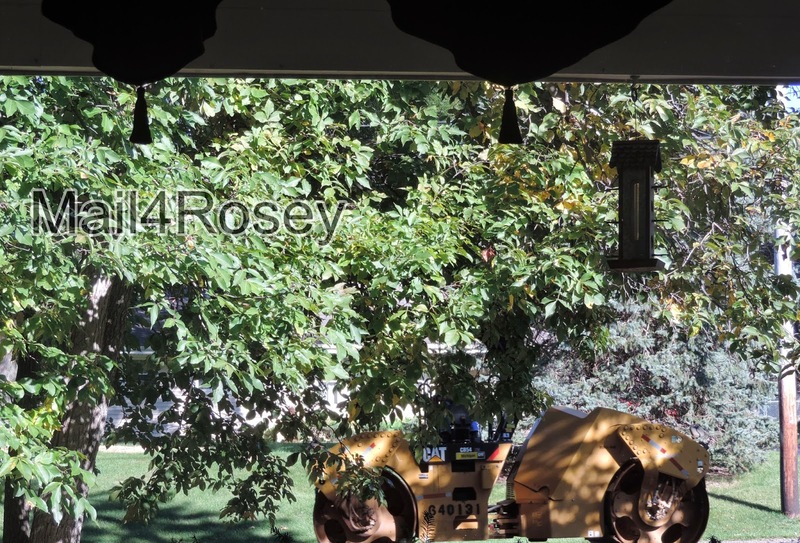 Hi Rosey, glad you had your street fixed! Have a nice weekend! They have done the same exact thing on the highway right near our home. They fixed the road but haven't come back to draw the lines. I hate driving that way. Well very glad they fixed it. Hope the lines are painted soon. It is amazing how far we have come. We have tons of road construction going on around here and I wish it would be as easy as patch. I'm always amazed at how fast everything dries when they repair the roads. Too bad the amount of repair jobs they actually do doesn't have the same kind of turnaround. That's great that you got the road fixed and got to learn about it too! Hopefully they will put lines on it soon though for safety reasons. LOL maybe the lines take longer to dry and they are waiting on the right time. I had no idea either that the patch up could dry so fast. I think they do still use tar on the roads. ;-P I do hope you get your lines back soon!